PLANT : Prostrate perennial herbs with glandless or nearly glandless foliage and racemes. 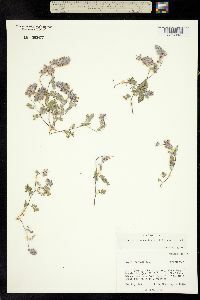 STEMS : gray-green, branched from the middle, sparsely canescent, to 30 cm long. LEAVES : 1-3 cm long, shortly petiolate; leaflets obovate to oblong-obovate, 2-3 mm long, 1-2 mm wide, white pubescent. INFLORESCENCE : a dense raceme 1.5-6.5 cm long. 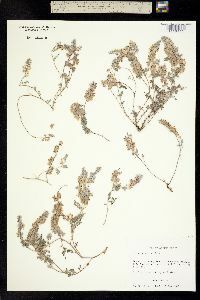 FLOWERS : 7-10 mm long; calyx lobes narrowly triangular, 2.0-2.5 mm long, acute, longer than the tube, ribbed, with prominent veins, pilose; petals purple and white. FRUIT : an obliquely obovoid pod, 3.0-3.5 mm long with two rows of glands on each side. NOTES : Dry, open slopes and grasslands: Cochise, Graham, Pima, 2011 VASCULAR PLANTS OF ARIZONA 3 Pinal, Santa Cruz cos. (Fig. 1B); 1150-1500 m (4000-5000 feet); Apr-Sep; se AZ, NM; Son. Mex. REFERENCES : Rhodes, Suzanne, June Beasley and Tina Ayers. 2011. Fabaceae. CANOTIA 7: 1-13.